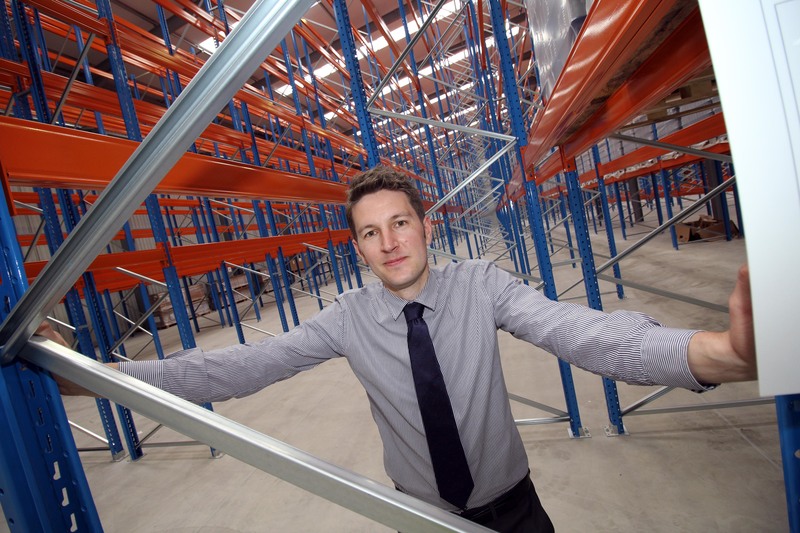 Newton Aycliffe company Stiller Warehousing and Distribution is looking to expand into new markets after opening a new £1.1m warehouse. Stiller provides cost-effective warehousing and distribution services to businesses in the North East region as well as commercial property lettings. Their new 40,000 sq ft, 5,000-pallet warehouse will increase by nearly 50% the family firm’s warehousing capacity at its premises in the heart of Aycliffe Business Park. Stiller, which employs 140 people, has ploughed £1.1m into the new unit, which will include a new 21st Century racking system and VNA (Very Narrow Aisle) handling equipment. The multi-user warehousing facility, which has been constructed by local steel firm Finley Structures, increases Stiller’s storage footprint to 200,000 sq ft and has the capacity to hold 5,000 pallets. And now the Aycliffe firm wants to explore new “clean” markets with what it calls “an investment in efficiency as well as expansion” in a bid to build on a number of recent contract wins. Commercial manager Matthew Stiller said: “This is another exciting development for the company and one which demonstrates the strength of our position in our market place. “The new warehouse offers a clean environment and state-of-the-art flooring, and our new racking equipment means we will be targeting different types of business. “We’re already taking on new customers, a variety of locally-based manufacturing companies, and we’re employing at least five new members of staff with this new warehouse. Stiller’s new investment is the first part of a two-phase development at its Ayclifre site, with more land earmarked for another new warehouse to accommodate a further 6,000 pallets. The new building was designed by ADG Architects of Darlington and BDN Engineers of Durham and erected by Aycliffe steel firm Finley Structures. Managing director Paul Stiller added: “The new warehouse has been built to the highest specifications. “It also offers excellent space utilisation. We’ve invested £60,000 in a VNA man-up fork-lift truck from neighbouring firm Linde Castle, which is a specialist piece of handling equipment enabling high storage density. “We’re also relocating a major part of our operation, Central Park in the middle of Aycliffe Business Park, back to our own premises. That has served its purpose but it was time for us to invest in this expansion. “The whole investment is to make our warehousing and distribution process more efficient, which makes us more competitive, and with that brings the prospect of more jobs. Stiller’s latest investment comes six months after it announced a new £15m three-year deal with food packaging firm Coveris Rigid, which is expected to increase annual turnover from £10m to between £12.5m and £13m this year. The new £1.1m facility takes Stiller’s overall investment in the last two years to £5.6m, during a time when several neighbouring businesses are also expanding. Stiller invested in a fleet of 12 new vehicles in 2014, including two 12-tonne vehicles, two urban trailers and four long double-deck trailers, and brought in five new Iveco trucks earlier this year to accommodate its deal with Coveris Rigid.